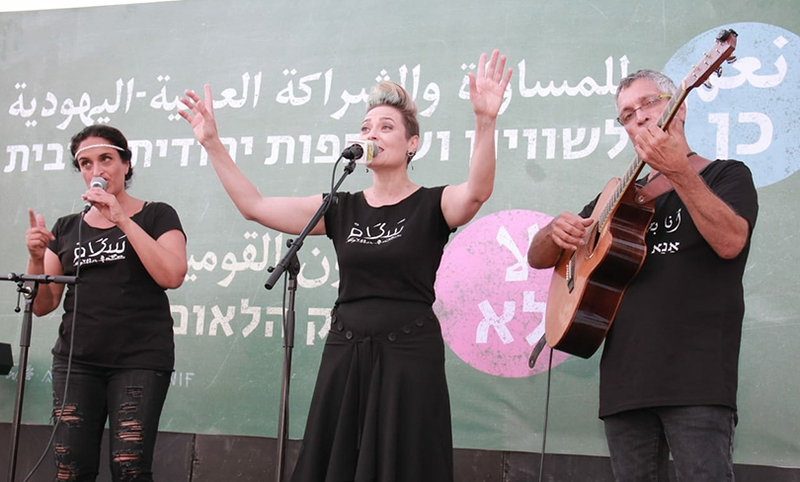 In response to the Nation-State Law, which canceled the status of Arabic as an official language of the State of Israel, the NIF community held “The World’s Largest Arabic Lesson” in Tel Aviv’s Habima Square last week. Thousands of Israelis gathered together to learn Arabic and hear performances by Arab and Jewish musicians. The event was organized by NIF and grantees including Sikkuy, The Hand-in-Hand School, Omdim Beyachad (Standing Together), The Abraham Fund and Givat Haviva. Arabic teachers taught from a stage, offering simple phrases often without Hebrew translation. The audience repeated after the teachers. In addition, a number of artists committed to shared society performed on stage, including Achinoam Nini (Noa) and Mira Awad.